"Disenchanted: Book One,"by C.K. 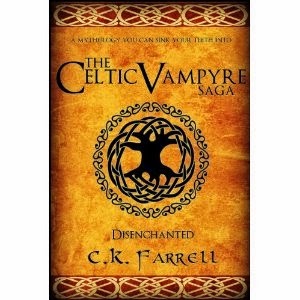 Farrell, is a book that will surely delight Gothic lit fans. The story follows Faelynn LeCroix, a determined woman who wants to find those who killed her mother and kidnapped her father. Her journey takes her to Nathaniel Valour, a powerful Irish vampyre, and their encounter raises more questions than it answers. I've always been a fan of more traditional, myth-oriented vampyre books, rather than the pop-culture vampire books, and this book is certainly more like the former. It has a cool Gothic feel to it. The plot is fast-paced, and the characters, especially Nathaniel, are fun to follow. Recommended for anyone who likes Gothic literature and vampyre stories!